The International Energy Agency (IEA) cut estimates for the amount of crude needed from OPEC this year and in 2018 after lowering its historical assessments of consumption in some emerging nations, according to Bloomberg. World oil markets are re-balancing as the Organization of Petroleum Exporting Countries and its allies implement production cuts, the IEA said in its monthly report. Still, inventories remain high and the volume of crude needed from OPEC is less than previously thought as consumption in some developing nations had been overestimated, it said. Oil prices have lost about 9 percent in London this year on concern that supply curbs by OPEC and partners including Russia aren’t aggressive enough to clear a global surplus. The agency lowered projections for the amount of crude required from OPEC this year and next by about 400,000 barrels a day. About 32.6 million barrels a day will be needed from the group this year, less than the 32.84 million it pumped in July. There are also growing doubts that all the countries involved in the accord to reduce supply are fully committed, the IEA said. OPEC’s rate of compliance with the cutbacks slipped last month to 75 percent, the lowest since the accord started in January. Iraq’s implementation was just 34 percent, Venezuela’s 28 percent, and the U.A.E.’s 53 percent. Adherence among the non-members coordinating with OPEC was at 67 percent. Despite the reduction in total demand estimates, the rate of growth for this year is stronger than previously thought, at 1.5 million barrels a day. “Producers should find encouragement from demand, which is growing year-on-year more strongly than first thought,” the IEA said. OPEC’s cutbacks are having some success as global inventories declined in the second quarter by about 500,000 barrels a day, according to the agency. 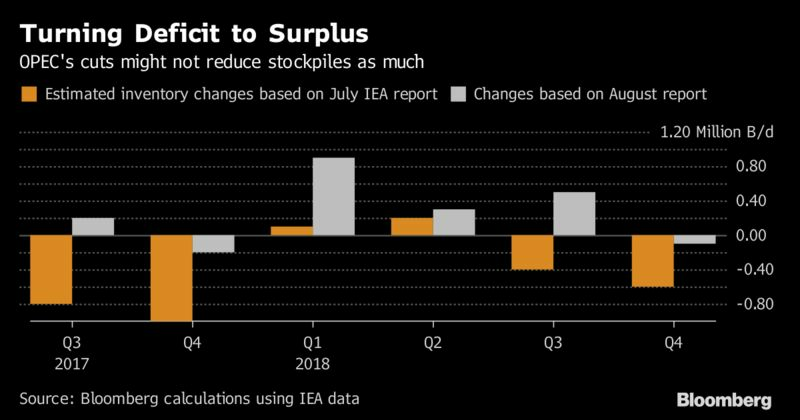 While that’s narrowing the surplus versus the five-year average — OPEC’s stated objective — stockpiles were still 219 million barrels a day above this level at the end of June, the agency said. With a lower demand outlook and higher OPEC output, “stock draws later in the year are likely to be lower than first thought,” it said.